Registration: Register in person at Twist Yoga, by telephone (425-778-9642), or click here to register online. The art of establishing Pratyahara, the ability to withdraw the senses from outer stimulation towards a peaceful home within. This is the doorway to meditation. 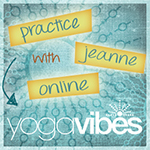 Friday will begin with a 90 minute asana practice with Jeanne. 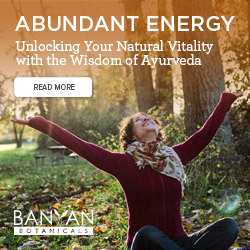 From here, we’ll dive into the anatomy of breathing, followed by the energetics of breathing and the directions of Prana through the Pranavayus. Students will learn how to observe deficiencies of Prana in each other and methods to find balance. We will close with a practice to feel this information in the body and energy. Saturday will begin with a 90-minute yoga class that focuses on the Pranavayus learned from Friday, taking the material further. Mudras will be introduced and students will be given an opportunity to work on their weakest area to bring the system into its fullest state. Using this new information we will explore methods of sequencing and teaching this material in your own practice and classes. We will then study the Nadis, leading us into the techniques of Nadi Sodhana and Pratioloma. 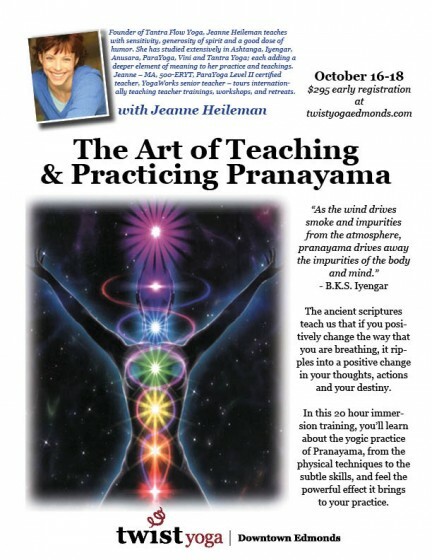 The techniques for teaching Pranayama will be covered today. We will close with a longer Pranayama session. On Sunday, we’ll complete our Pranic journey with 90-minute asana practice, followed by a 30-minute seated Pranayama session. Following practice, we will study the Bandhas. The art of teaching Pranayama to others will be discussed with attention to the risks that could occur if one is careless. We will close with a longer Pranayama practice taking the students into meditation and a peaceful, glorious ending to the weekend. Cancellation Policy: Refunds available, less a 15% administration fee, up to 14 days prior to workshop. No refunds allowable after that time.